ISU nematologist Greg Tylka demonstrates how to check for SCN females on soybean roots during the growing season. 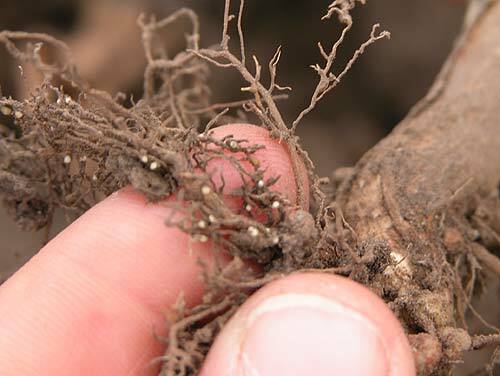 SCN cysts are visible on these roots - Photo: University of WIsconsin. Click on image to view a larger version. 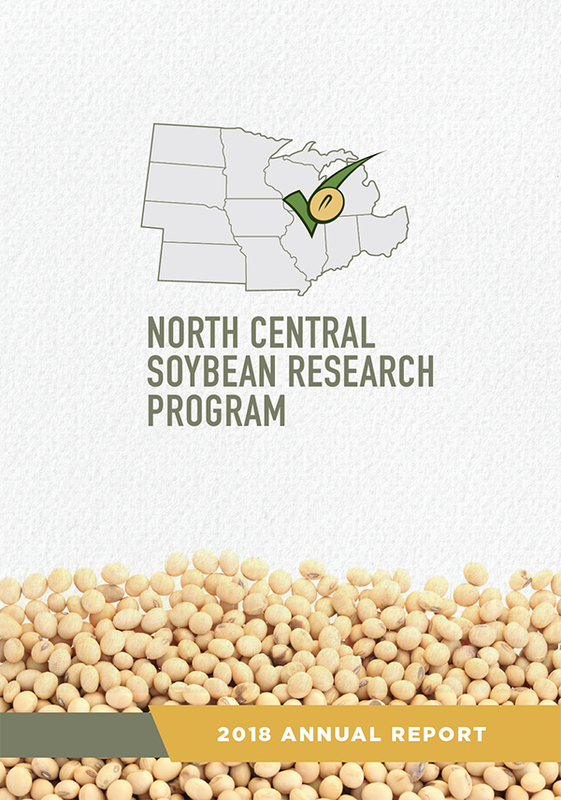 It also is an effective way to assess how well SCN-resistant soybean varieties are controlling nematode reproduction in fields known to be infested with SCN. There should be only a few, not more than 10 to 20, SCN females on the roots of a resistant variety if the variety is effectively controlling the nematode. Later in the season, adult SCN females and cysts appear on new roots that are located deeper down in the soil as well as farther laterally from the stem of the plant. 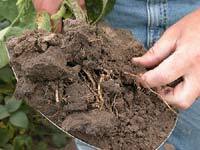 Use your shovel to dig up yellow and/or stunted soybean plants. You want to dig at least 6 to 8 inches away from the plant stem to make sure you haven't cut off much of the root system. Never try to pull up a plant to see SCN, you'll lose too much of the root system and strip off the nematode females as you pull the root system through the soil. Gently shake excess soil from the root system. Check the root system for adult SCN females. They will be about the size of the period at the end of a printed sentence --a lot smaller than the nitrogen-fixing nodules. They will be white or light yellow and lemon-shaped. A magnifying glass or land lens might help you see the females. SCN females are easier to see in dark soils than in light soils. If you are scouting a field that has never been checked for SCN, consider that SCN can be in a field for many years without the tops of the plants becoming yellow or stunted. 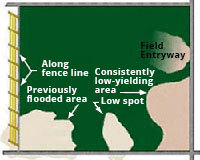 For this reason, it is a good idea to include healthy-looking plants in your scouting. 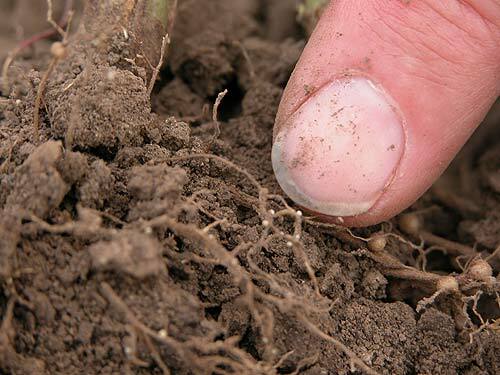 If when scouting your fields, you found SCN females on the roots, or if you weren't able to find females but still suspect SCN is present, you'll want to take soil samples and have them tested for SCN. 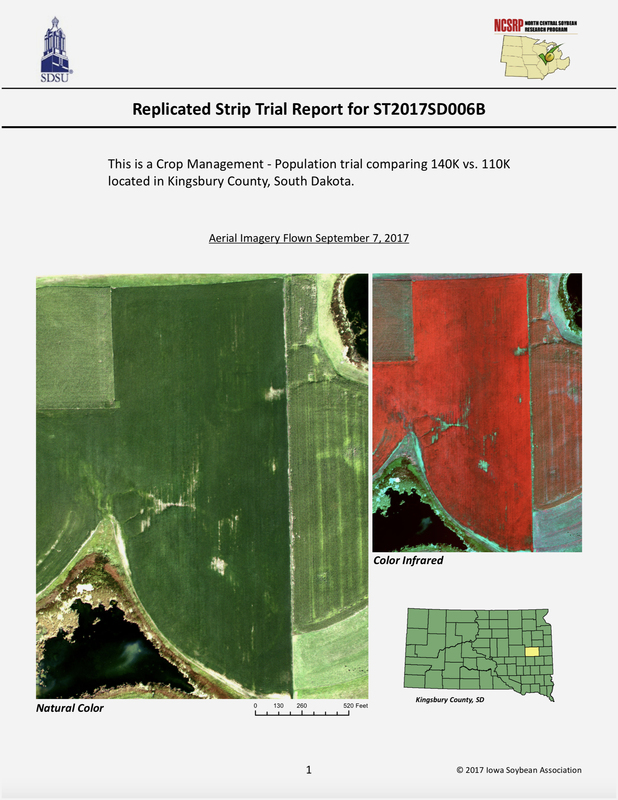 A soil test is the best way to estimate the SCN population density in your field that will help to determine guidelines for managing SCN. Visit TheSCNcoalition.com for state-specific management recommendations and locations of public and private SCN testing labs.